Yesterday (February 6 2018), SpaceX successfully launched the Falcon Heavy rocket. This rocket, first publicly announced in 2011, had been a dream for so long I almost could not believe it was only a week away. Then a day. Then an hour. At the moment of lift off, 30 colleagues and I were crammed in a tiny conference room around a laptop with tinny speakers. Several of us had worked on this particular vehicle over its protracted development. You could hear a pin drop. And then the 27 Merlin engines roared to life. It flew to space. It staged successfully. It landed two boosters on the ground, and narrowly missed the hat trick. The upper stage flew a whimsical payload of space suit, star man, and Tesla Roadster around the world (and over Australia) once before firing for a third and last time over its home in LA, boosting it away from Earth toward the orbit of Mars. It will orbit in empty space for many thousands of years. What does this mean? SpaceX does hype well, and millions of people tuned in to watch the launch. People reacted to this concatenation of the impossible in many different ways. I felt a profound catharsis, a joy, a renewed faith in humanity. As usual, media got a handful of details wrong. This is not the first car ever launched - but it is the first production electric car ever launched! The French mounted (but didn't launch) a Renault once upon the Diamant BP4 rocket, NASA launched 3 electric rovers to the moon in the early 1970s, the Soviets landed two nuclear powered robotic rovers (Lunakhod) on the moon, the Chinese one solar powered rover (Yutu), and of course NASA has also dropped a total of four electric robotic rovers on Mars (Sojourner, Spirit, Opportunity, and Curiosity). Second, the Falcon Heavy has been described as the most powerful rocket since blah. As far as I know, it is the most powerful liquid fueled American rocket since the Saturn V. Other rockets with greater thrust include the Soviet N1 rocket, which experienced four catastrophic launch failures in the 1970s, the Soviet Energia rocket, which launched twice in the 1980s, and the space shuttle, which derived most of its thrust from solid rocket boosters rather than liquid engines. It also has the largest payload to orbit of any American rocket since the Saturn V. Technically the shuttle had more mass in orbit, but a lot of that was shuttle, and its total payload was, at 25T, comparable to other modern rockets. Officially, Falcon Heavy can deliver 64T to LEO in expendable mode. Usually, though, Falcon Heavy will be used in reusable mode. In this configuration, it can launch a similar payload to a single stick Falcon 9 expendable launch, or around 25T. Provided that recovery is usually successful and turnaround on the ground quick and cheapish, this mode for medium lift launch is extremely competitive. SpaceX, enjoying a high profile, has an unusually high concentration of public pundits, commentators, and self-appointed experts who are always ready and eager to deliver a verdict on a mission or design choice. Let me add to their chorus and say that launch is really hard, and getting it right the first time is just extraordinary. It is impossible to overstate the magnitude of this technical achievement, particularly given that it was privately funded and relatively quickly developed. It is always easier to critique than to build, and I was somewhat dismayed by the usual twitter outrage over everything from the carbon footprint of the rocket to the colour of the car. People, SpaceX *deliberately* chose to be provocative. Why? Because they're competing in an industry against incumbent heavyweights who, instead of using their launches to sell electric cars or liberate the launch market, lobby for protectionist policy and sell weapons to third world despots. If you think humanity has a future, that future involves space, and it has to be done somehow. 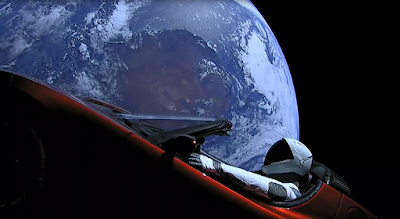 So, of course there was Elon's red Tesla sports car driven by a mannequin in a space suit with cameras on every angle, a bunch of memes scattered around, and a tiny hot wheels Tesla with a tiny space suit on the dash. I wouldn't be that surprised if this particular car was retrieved in flight and plonked in a museum before I die of old age, or internet outrage. This launch and its excitement was important. It showed the two generations born since Apollo that space was cool again, space is relate-able, and space is exciting. NASA does space very well, but NASA is beholden to a bizarre incentive and funding structure, and as a result must be extremely risk averse in both mission execution and PR. NASA and SpaceX have formed a productive partnership in part because, for cents on the dollar, NASA has been able to outsource a lot of development and branding risk to SpaceX. As a serious space nerd, I was born in the late 80s, an era of shrinking ambition and fading glory. As I learned more about the practice and prospects of space travel, I grew more and more despondent. There was every chance I would live and die without seeing the next big step. This launch was not that step, but it foreshadows it. I can now live with hope. Hope to see, and perhaps to participate in, this really exciting adventure. Maybe Australia will even get a space program? "There isn't a problem in space that can't be most effectively solved by building an even bigger rocket on Earth." My generation of space nerds has spent decades working out how to design ambitious missions with small, bite-sized launches. Falcon Heavy is big enough that it significantly raises the bar for harebrained space activity design. And SpaceX is deep in development of the BFR, a rocket so mind-numbingly huge that it can launch perhaps six times as much as Falcon Heavy. Instead of spending a decade playing space lego in LEO, a rocket like this can launch an entire neighbourhood in fifteen minutes. The final point I want to make goes back to the cost efficiency and reusability of Falcon Heavy. Falcon Heavy is really just a special center core that is compatible with any two normal Falcon 9 boosters that happen to be lying around. Provided that SpaceX has perhaps half a dozen Falcon Heavy cores, plus steady upper stage production, it can perform essentially on-demand heavy lift launch. SpaceX has already successfully recovered 21 Falcon 9 boosters - more than half the total they've ever flown. We are on the cusp of a paradigm shift in launch. Today, launch is so expensive and missions so difficult and dangerous that program management necessarily has to function in an incredibly risk averse way. In the early 1960s, the US launched dozens of Ranger and Surveyor spacecraft at the moon in preparation for Apollo. What is the difference? In the 1960s there was an essentially unlimited supply of ICBMs that could be used to launch experimental, iterative, minimalist designs. Today, a single space robot carries the hopes, dreams, and careers of hundreds of engineers, scientists, and technicians. But there's essentially no reason why previously flown systems, such as the Curiosity Rover, can't be mass produced and one with custom instruments sent to Mars for every university on Earth. It is my fervent hope that Falcon Heavy symbolizes the return of launch supply abundance and post-scarcity robotic space exploration. One Falcon Heavy launch could easily fly six Curiosity-style rovers or literally thousands of solar powered drones to Mars. We're going to need to upgrade the Deep Space Network! 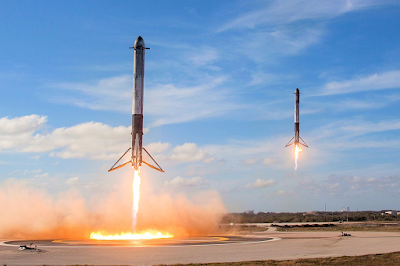 I would like to see NASA, ESA, JAXA, or any other funded agency sign a contract with SpaceX today that guarantees a Falcon Heavy launch to every planetary exploration target on every launch window - a steady campaign of about one launch per year per planet. With a steady pipeline of launches guaranteed, the race will be on to fill each one up with a variety of complimentary and innovative payloads. Let's do this! An exciting time. I wonder how this will end up affecting the cubesat market - will you end up with much larger smallsats? No idea. The cube sat market is so bizarre on every level! Can Falcon Heavy land all three boosters on barges? I think this will save a lot of fuel and increase capacity. Need more drone ships. Skip the drone ships and buy an old oil rig. Something more stable than a barge. Deep water oil rigs float anyway, and the drone ship is moved to different places depending on the launch. It was really cool to watch. I saw the challenger explosion when i was little. I wanted to be an astronaut and i saw columbia explode. I wasn't looking good for US. With companies like SpaceX space can be open to all...who can afford it. Space will never be really cheap, but it might be cheap enough to do once, like going to Antarctica. "This launch and its excitement was important. It showed the two generations born since Apollo that space was cool again, space is relate-able, and space is exciting." My 6th grade students were so excited for the FH launch and booster landings. It almost brought tears to my eyes. Yes! Now, if some smartass asks what is math good for, there's an obvious answer. Informative article and i read it full . So much thanks for well shared .